Cops N' Goblins Join the Buena Park Police Department for this Pre-Halloween Event on October 30th! 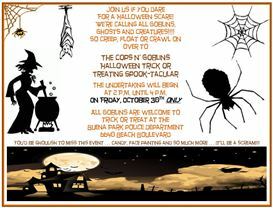 The Buena Park Police Department is pleased to announce our “Cops N’ Goblins” Pre-Halloween Event; a safe environment for children to “Trick or Treat.” It will be held at the Buena Park Police Department on the day before Halloween, Friday, October 30th, 2015, from 2 – 4 p.m. Children are invited to attend to trick or treat through the Police Department. They can also enjoy face painting, a haunted house maze, and much more! Costumes are encouraged. We have teamed with local entertainment venues to provide our Community with a place for fun and activities. So, come meet your Police Department and join us for this safe and fun-filled event. Please click below to view our flier ... Hope to see you here!